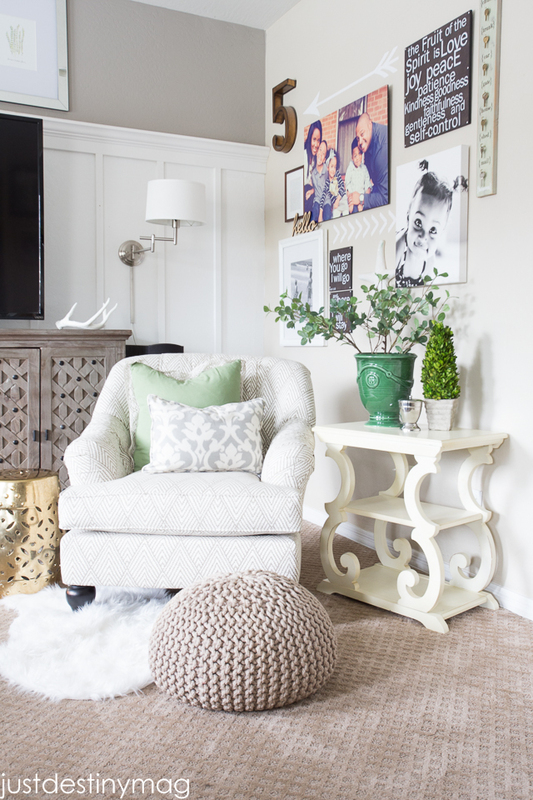 I’m back today with a family room update! The last time I shared it was here. Since then I’ve done some updates to the entire area. 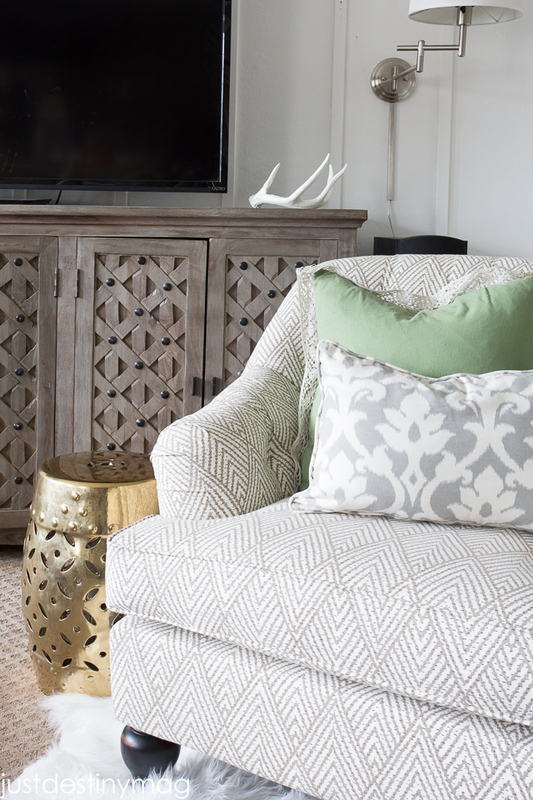 We replaced our Ikea console table with a beauty from DownEast Home. It was the only one that I could find that was long enough to fit our family room. Most tv consoles are super short and deep but I wanted something that acted more like a buffet with lots of storage. I even thought about going the custom route but when this one went on sale, the hubby and I jumped right on it. 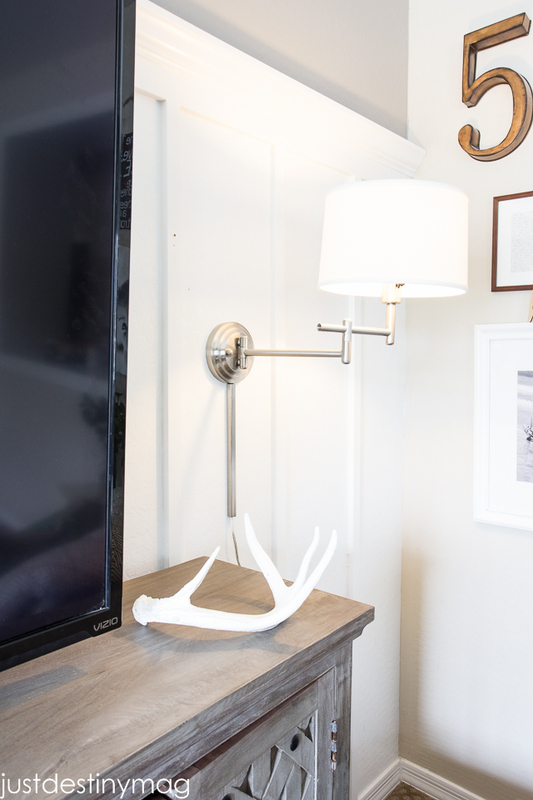 We also I added some gorgeous and functional lighting to the sides of our TV. These Kenroy lights are so perfect in here I can’t even tell you. I love the fact that they are plug ins and act like sconces more than lamps. The swing feature makes it easier to add light where we need it. Plus it adds to the overall ambiance of the room. I’m all about mood lighting! 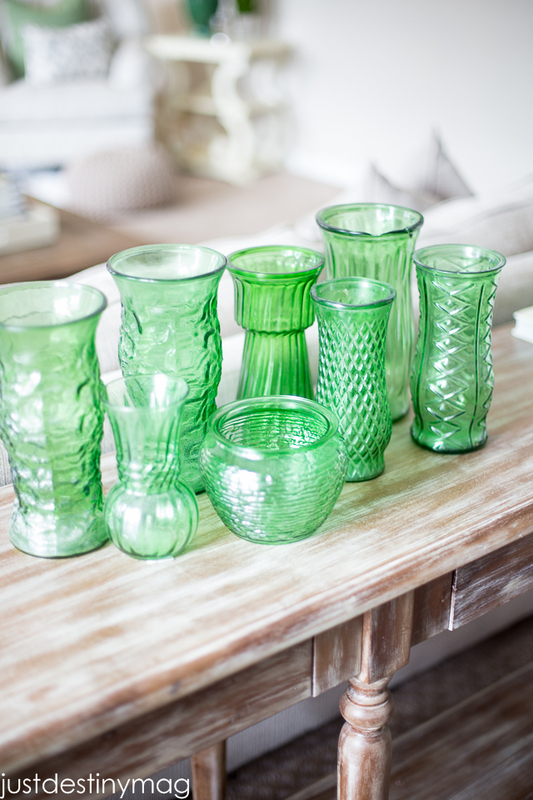 Thanks to the team at Kenroy Home for sending us a pair of these beauties for our space! I also added a chair and a coffee table! Remember last month I won a gift card to Living Spaces? Well I spent those winnings and I spent it well. This chair so so comfy and deep according to some our guests that have tried it out:0) I was very attracted to the fabric choice,which is surprisingly a in stock choice! So I got to bring this baby home same day! Even though I wanted to spend the money on some things for our playroom, I’m happy that I spent it on some upgraded items in our family room. The coffee table is something I shared on my Instagram feed awhile ago and was actually the first piece I bought. Again, it was in stock and I was able to pick it up SAME DAY from Living Spaces! Seriously makes me so happy. lol! It’s a beauty that reminds me of the baluster table from Restoration Hardware but way less! As you all know once you get a new piece, other pieces follow. So when I saw this end table at my local Homegoods the other day I knew it was the PERFECT piece for this space. The curves and color on this baby is gorgeous. 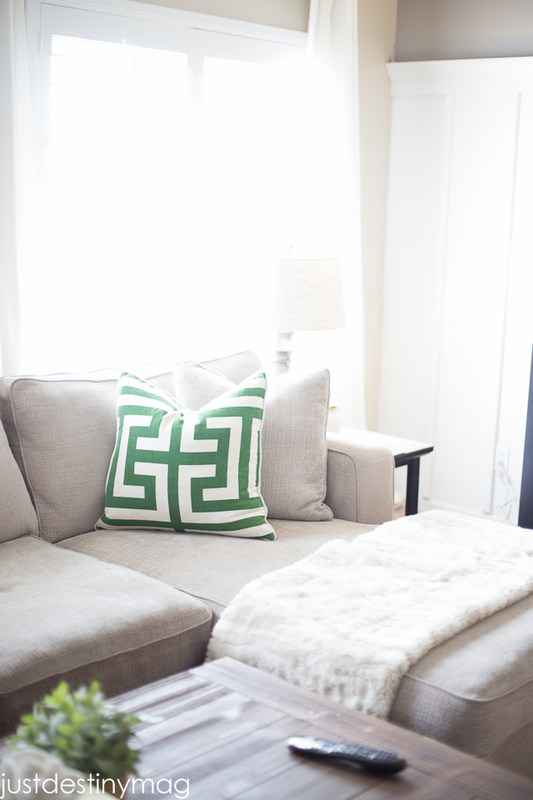 I like to mix and match my furniture and I usually go with items that have some type of curve on it. Because of the new chair annnnd table :0) I decided to lighten up my brown paint with Functional Gray by Sherwin Williams. Which is differnt from the rest of the walls. That one is called Oatbran by Valspar. A wonderful neutral. On top of that new paint color you can see some beautiful prints from a Etsy store called Color Zen. 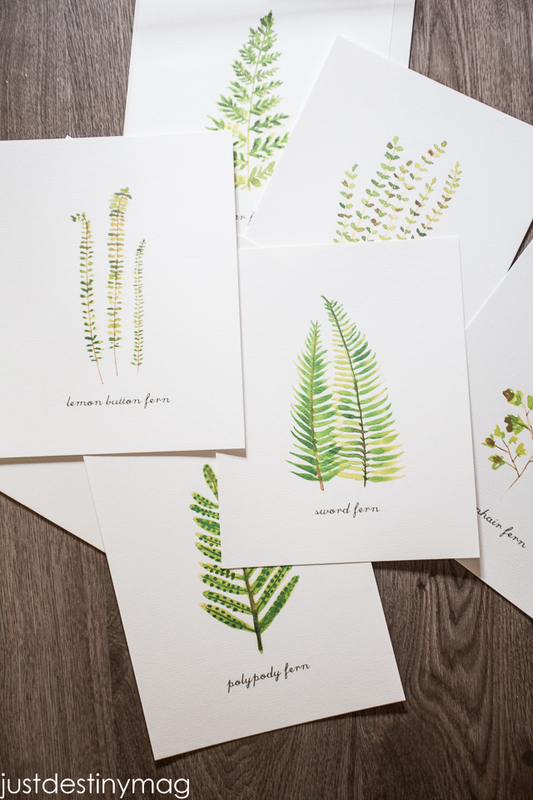 They are watercolor prints of different ferns. 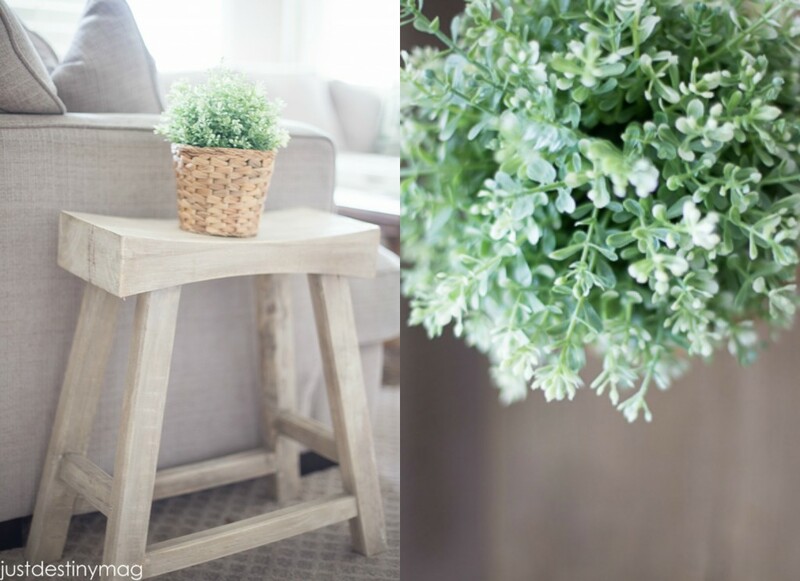 I adore the natural element of them and I knew they would be perfect for this space. 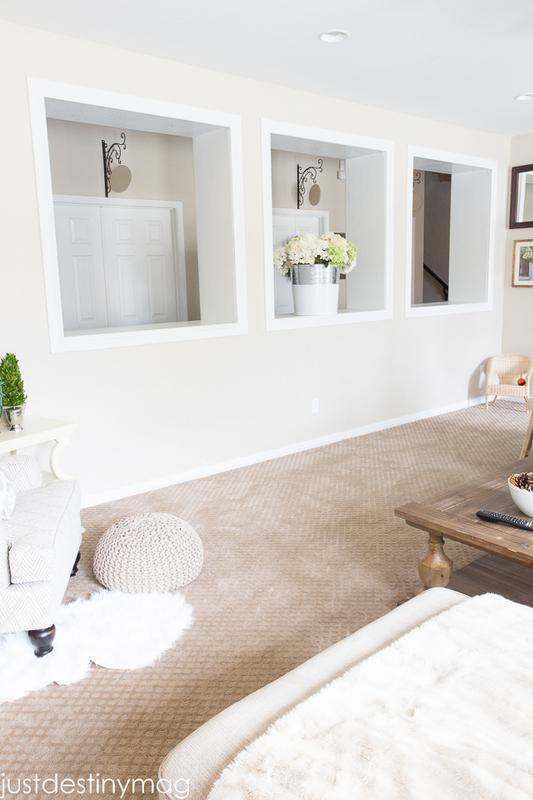 Here are some more photos of our family room! Enjoy and look for a list of sources at the bottom of this post! We haven’t updated these niches in a while BUT I do have a plan for them! Just trying to figure out home much it will cost! What would you do to these niches friends? Thanks everyone! 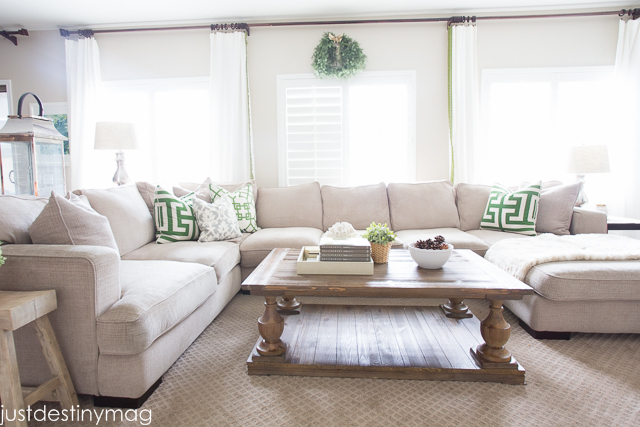 Hope you enjoyed my family room tour! Let me know if you have any questions or need to point out any spelling errors that might be bothering you:0) lol! Gorgeous! As always. I just adore your style. Amazing!! 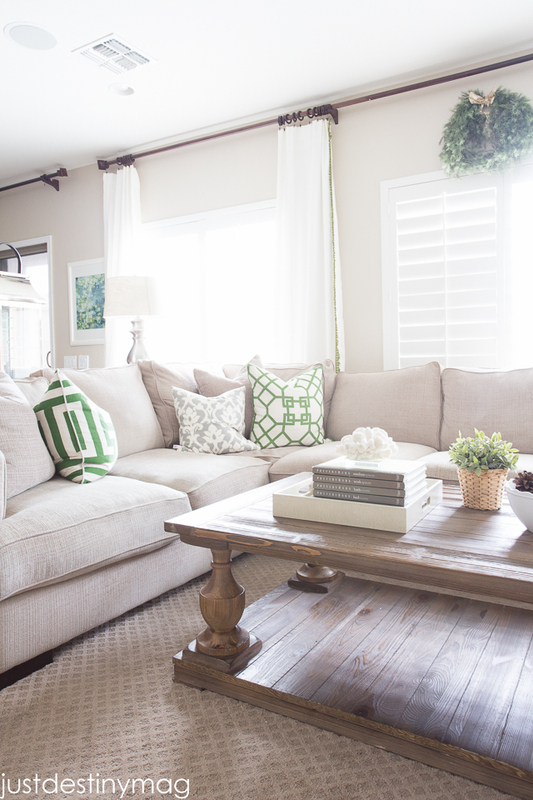 It makes me wanna redo my family room. 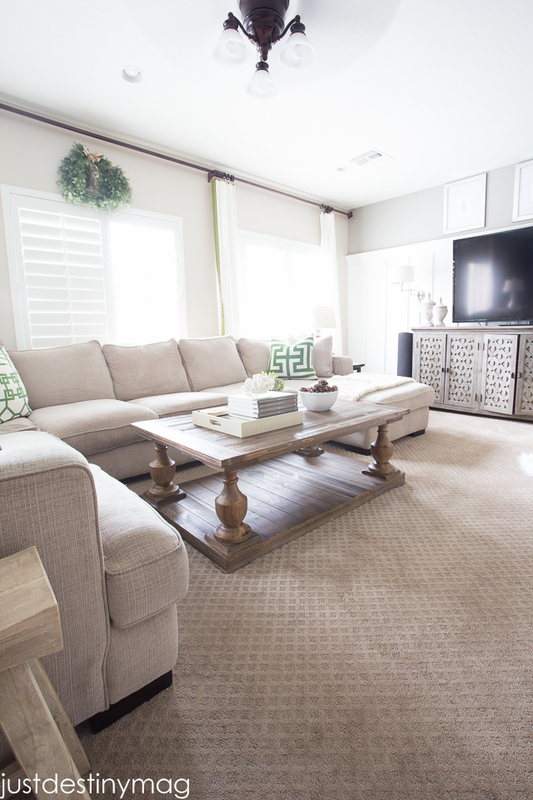 Can you tell me the brand of carpet from Lowes and color? Are you happy with it? Is it holding up well? Thank you!! Thanks Erin! I will look for you. I can’t remember off the top of my head:0) But I’m sure it’s in my paper work! I know for sure it’s Stainmaster if that helps! Beautiful room! Could you share about your curtain rod? I also have a very long window and can never find a rod that works. Your’s looks great! Oh yes! That is from Bed Bath and Beyond! It each rod connects so you can make it as long or short as you want it! 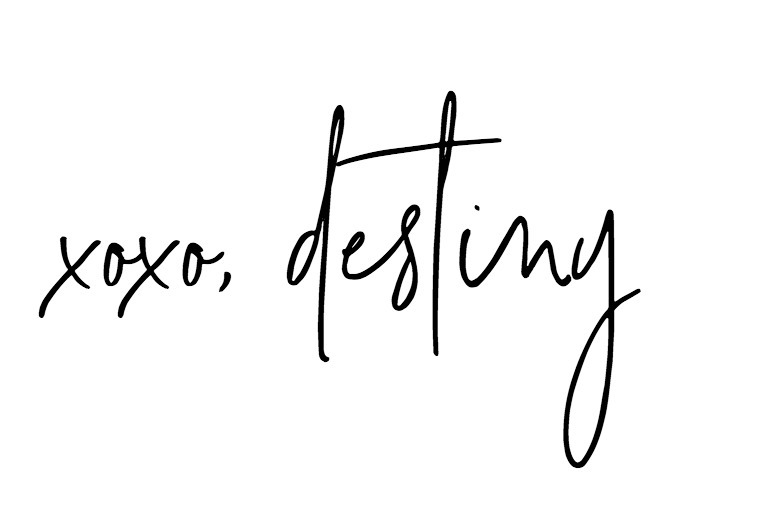 Just gorgeous destiny! I love the details you shared as well as the big pieces! each one adds so much warmth…everything makes a difference! Beautiful space friend! It’s so cozy and inviting. I just love your taste! 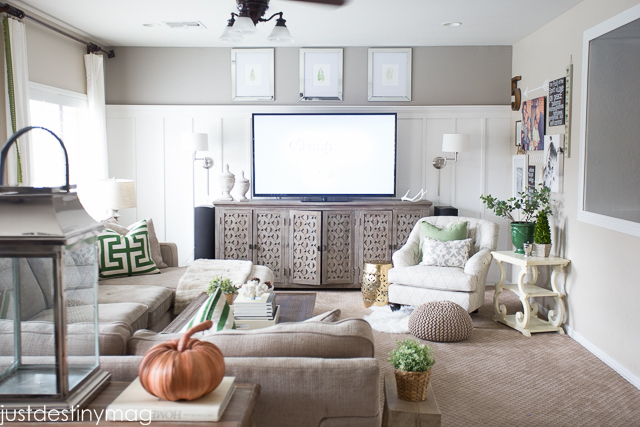 Oh Destiny, your family room is just gorgeous. You pulled everything together beautifully. Such a pretty room. I love your style. 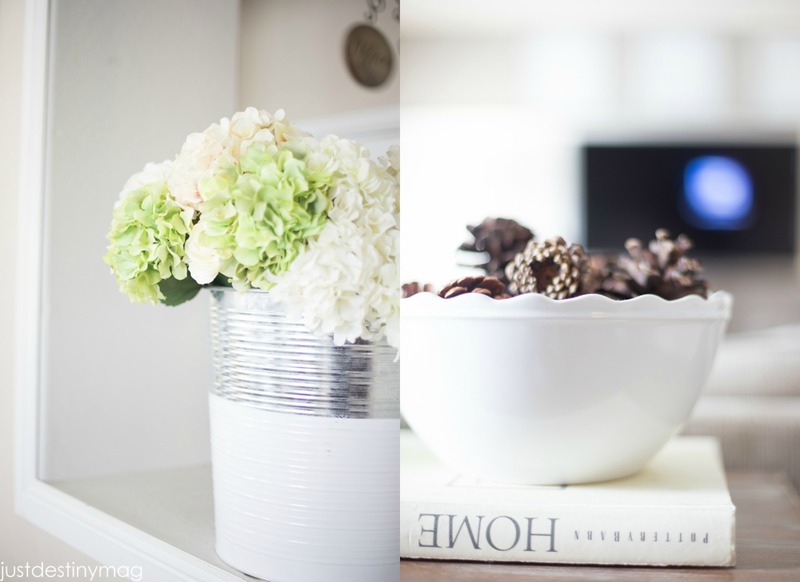 Just found you via Instagram and the round robin giveaway…and absolutely love your space! 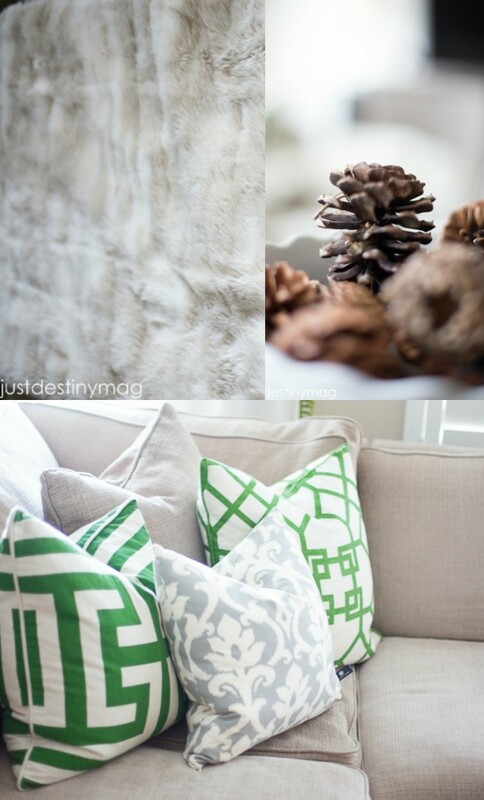 I am in the process of doing my own family room in grays and greens. Love your chair!! I am doing drapes in the same fabric. How refreshing your space is. I love blue and grey but I think I just broke up with blue and like green now! Can you share your source for the little signs/hangers above the doorways in the hall? Hi Melissa! I made those signs years ago! You are such a tallented designer. I love your taste. You must have a lot of energy!! Girrrrllll, your house is RIDICULOUSLY GORGEOUS! You got the touch! Just love your pics and happy style! Very inspiring. What kind of camera do you use? New here! 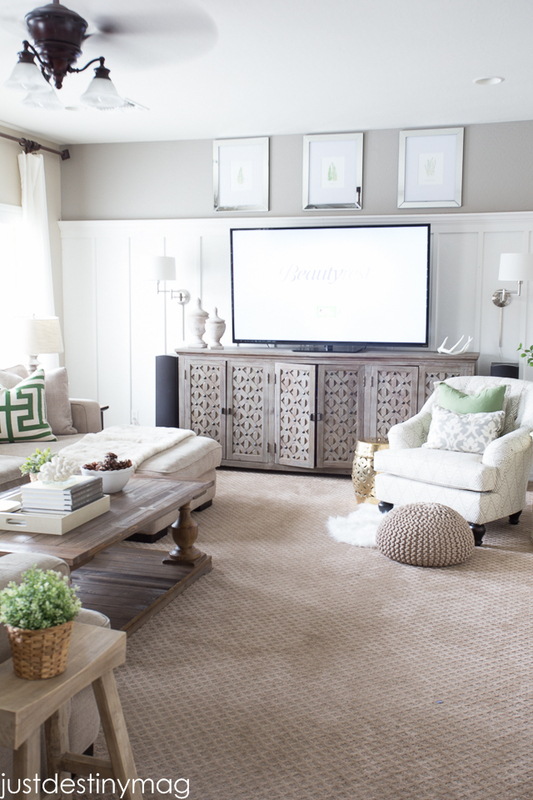 Just needed to comment to tell you how this room is just beautiful! I got them from Target! Such a beautiful room!!! Wow! I’m a new follower to your blog and find myself lost in all the beauty! 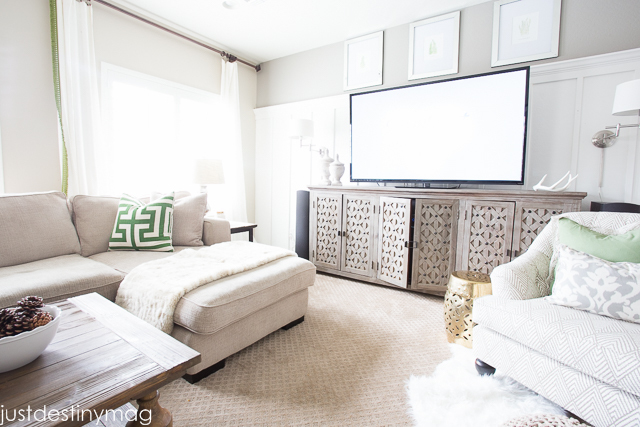 Did you ever share a tutorial how you did your living room board and battan wall?? 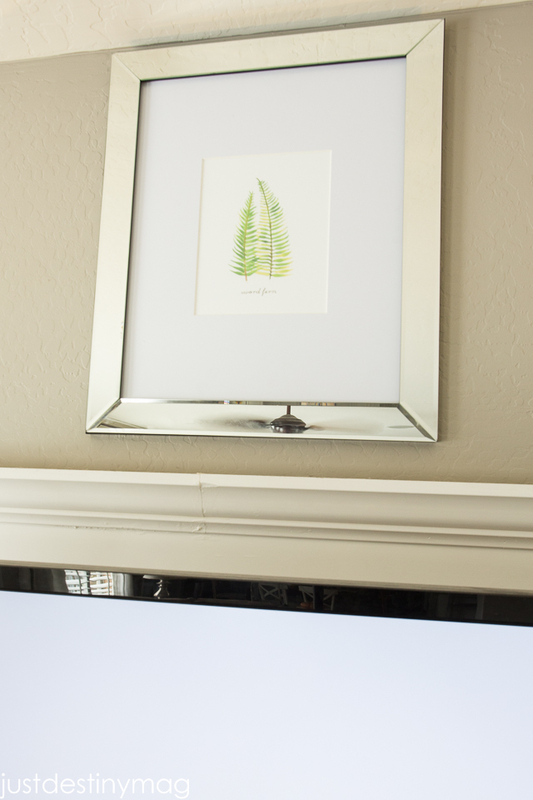 I think this is a perfect solution to our standard AZ home TV cutout niche :). Thank you for sharing your gorgeous home! What couch is this? I am trying to find it but concerned about the care. I have a toddler who isn’t exactly the neatest! thanks! I am new to your blog. 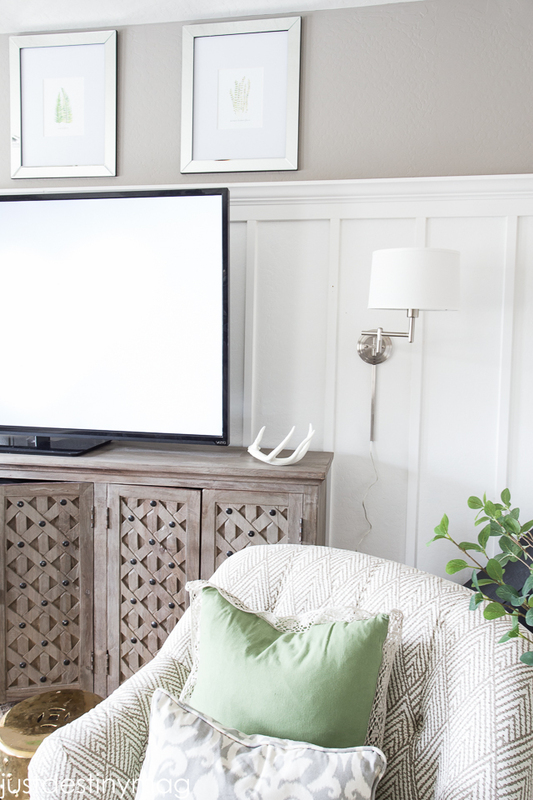 Have you ever blogged about your wall behind the T.V.? Not sure what to call it but it looks like it is framed. I am new to your blog. 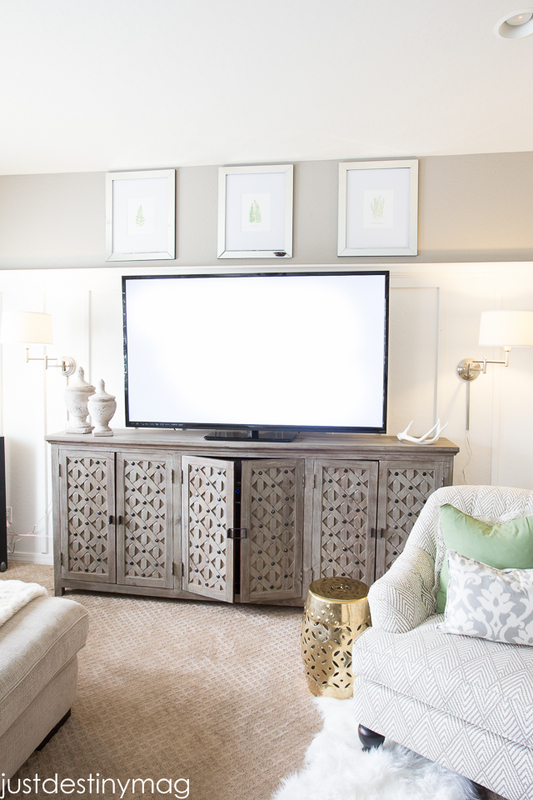 Have you ever blogged about the wall behind the T.V.? Not sure what to call it but it looks like it is framed. Very FRESH! 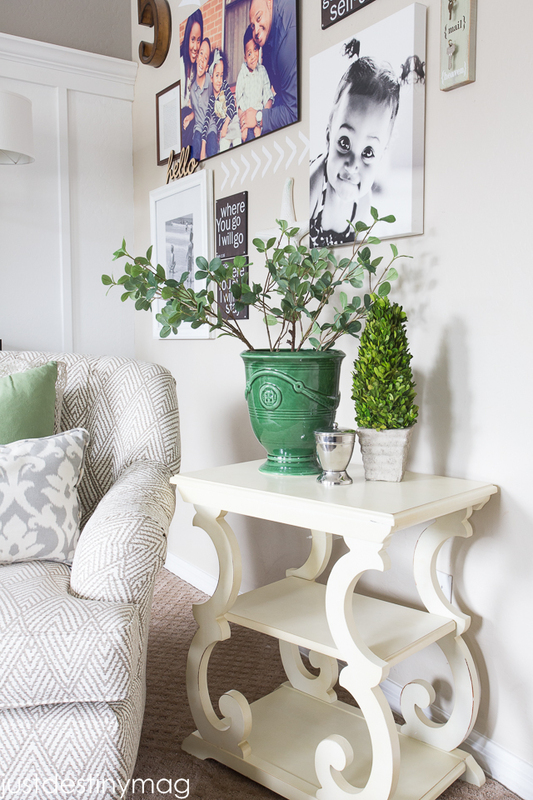 I love the touches of green, the plants… a little bit of a botanical vibe while still very cosy.